A quick note on installing Linux Mint on an Acer eMachines netbook (em350) for anyone going down the same path. This netbook is a few years old and the installed OS Â (Windows 7 starter) had slowed almost to a crawl. After some painful session trying to work out what was causing excessive load under Windows I decided that installing Linux was the best option. 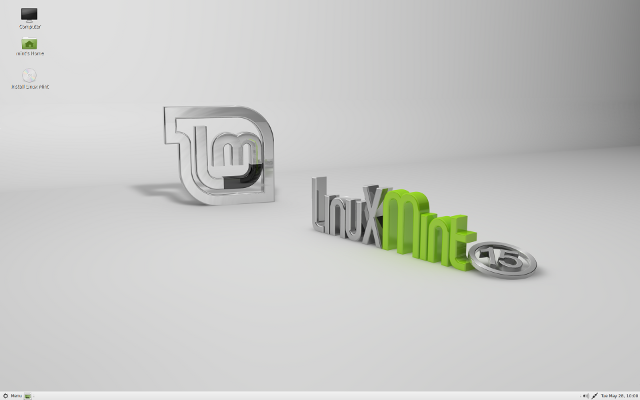 Linux Mint seemed like a good choice. Based on Ubuntu with a good install base, options for Gnome 2 or 3, KDE or Xfce Desktops and it also has a version based on Debian Testing rather than Ubuntu. The first step was to use pendrivelinux to create a bootable thumb drive using their universal installer. I downloaded the current iso for Linux Mint 15 ‘Olivia’ and chose the Mate desktopÂ version because it looked like a better fit for the netbook given its lack of graphics power. I then needed to make the netbook boot from the USB thumb drive. There are a two ways to do this. You need to hit F2 when the machine is booting up to get to the BIOS settings. Here you can alter the boot order to make the USB drive a higher priority to the HDD. Otherwise there is an option to enable F12 to select the boot device. This is where I had the first problem – the computer started to boot from the USB but then immediately froze. After a bit of googling I found a post suggesting trying a new USB stick . The USB I was using was a few years old, so I tried again with a newer Sony 8G microvault and it actually worked! Â Once you boot into the live system there is an option to install. Everything is fairly self-explanatory after that! I now have a much faster netbook that boots up faster, shuts down faster and doesn’t grind to a halt. Peter, hi! I’ve done the same thing, and I have a fast and friendly notebook. But, I have a strange issue, for some reason, few days after installation, the system cannot find any more the wifi connection, saying that there are no any proprietary drivers; also it cannot find any relevant hardware. If I reinstall mint, it will do the same: everything’s ok and after a few days, suddenly, no more wifi. Have you had the same issue? Any idea? No, haven’t had that problem. Strange. I guess try the latest update to Mint. But now I changed again for Linux Mint 17 Qiana. The more I learn it the more I like it. Installation from an USB stick is fast and easy. i had an old em350 which became useless on windows. it works reasonably well considering its age andspecifications , on solus, minte mate, lxle, as well as on cloudready.